The allowed tolerance for the liner standout above the block is 0.001 – 0.004 in. Therefore you need to raise the one liner up by about 0.006in. 3 potential remedies/things to look for…..
1. Interchange the liners into the different bores and re-measure. This will tell you if all the liners are the same, or if it is the liner shelf on the block which is incorrect. 2. Easiest way is to add shims to the liner that is currently below the block. Of course, you then need to find a shim to suit. Our local engineers could not source any the correct size, but you may be able to find someone who can. 3. Third option is to grind the top of the block down (in your case about 0.006in) and then deepen the liner shelf in the other 3 bores by the same amount. Technically you will then need to reduce the top of the pistons by the same amount (this can help make your engine easier to start, as there will be a slight increase in compression). Your local engine machine shop should be able to do this. This is the solution that we used with the block from the tractor in the Engine Rebuild DVD. With this method you do, of course, also get the block ground perfectly flat which is not a bad thing. This photo shows the 4 cylinder block from a MF35 and has been ground down to solve a problem with liner stand-out. Note the cross-hatching on the new liners. There is no need to glue the liners in or seal around them. The head gasket (when applied to the correct liner standout) will provide a perfectly good enough seal. Remember to get your head gasket the right way up – it will be marked TOP. Hope that information is of some help. Thanks for the very useful and informative reply to my email. 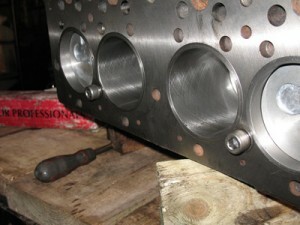 As my cylinder block is still fully stripped down I think I’ll take your advice and get the block machined. Also, what is the assembled piston protrusion height? I need to check what heights I have after my cylinder block has been machined so I can establish whether the piston crowns require altering. Perkins give a figure of between zero and -0.005in below the block on the 3 cylinder engine, but I cannot find a published figure for the 4 cylinder Standard engine. I suppose that you’ll have to find out how much has been ground off your block and reduce the pistons by the same amount. Remember that when the engine gets up to working temperature that the aluminium pistons will expand more than the iron of the block, so it may make sense not to have a protrusion height of exactly zero. Nice to see someone thinking and working to such precision. It is engines that are assembled with this sort of precision that become good starters. Sorry I cannot find the exact figure you are looking for. On our 23C the stand outs vary, do they all need to be exactly the same or can there be some allowable variation? If some variation is tolerable, could you tell me how much please? the correct joining compund by the manufacturer of the engine calls for Hylomar which is what I used in my TR4. How did you crush the fo8’s to determine you had uneven liners? Placing the liners into the hole tells you nothing the insert into the block can hold the liner out or allow one to go further in until they are actually pressed in. Hi, could someone help me with liner stand out. The new liners I have have a lip on the top, should the standout measurement be taken from the higher or lower lip? Hi. I had a similar problem with unequal liner heights. I got over it by making a shim out of a flattened thinners can! I used a mallet gently on the liner to make an impression on the tin, cut it out with scissors, and placed it on the worn liner shelves. My tractor still works for it’s living, and has carried this repair for over ten years.I would recommend this course of action as an alternative to expensive machining. I.J. This is an interesting subject I have had the same problem with a renault 5 engine and normaly there are three gaskets available, but they no longer stock them and I was advised to use loctite silicone sealer to make sure the liners were above the block. Also it was advised to put the highest liner at number one. To what extent this reflects on the MF engine I don’t know, mayby the mechs could give an opinion.